Over 30 civil society initiatives for regional and local development were presented at a two-day conference which opened in Tbilisi on October 24. The conference summarised the results of a small grants programme rolled out across Georgia in 2015 and 2016 assisting civil society to play an active role in resolving local social and economic issues, and fostering links between local authorities and citizens. The initiative is being carried out by the United Nations Development Programme (UNDP) and a Georgian non-governmental organization, the Civil Development Agency (CiDA), with support from the Swiss Cooperation Office for the South Caucasus (SCO) and the Austrian Development Cooperation (ADC), and in partnership with the Ministry of Regional Development and Infrastructure of Georgia. Local projects implemented by civil society and community organizations in six regions of Georgia – Kvemo Kartli, Racha-Leckhumi and Kvemo Svaneti, Guria, Samegrelo-Zemo Svaneti, Mtskheta-Mtianeti and Imereti - addressed a range of areas, including municipal services, education, economic opportunities, environmental and energy issues, and citizen engagement in decision-making. “The small grants programme helps resolve specific local problems. It contributes to regional and local development by increasing public activism and engaging civil society, the media and citizens. The programme participants receive practical experience of cooperation with the municipal and national authorities, which still needs to become a common practice in Georgia,” said Tengiz Shergelashvili, Deputy Minister of Regional Development and Infrastructure of Georgia, in his opening remarks to the conference participants. The small grants programme is part of a larger initiative implemented by UNDP with funds from the governments of Switzerland and Austria, to promote the decentralization of governance in Georgia and help the country adapt and introduce the best European models of regional and local development. “The success of reforms in both regional and local governance of Georgia largely depends on the active engagement of citizens who are the true benefactors of this challenging process. According to the UNDP’s recent survey, citizen engagement with local governance remains as low as 20 percent and has not changed throughout the last three years. 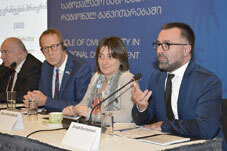 Practical initiatives undertaken by local civil society organizations are critical to help citizens get involved in decision-making as well as to help local authorities understand and address the real needs of people,” said Niels Scott, Head of UNDP in Georgia. According to Zviad Devdariani, Executive Director of CiDA, most grants have been given to the projects which have been targeted at increasing role of civil society in decision making process. “UNDP has carried out number of important projects in Georgia to support both government structurea and civil institutions. So, this is very good expression how the UN looks at the contribution of civil society in the process of Georgia’s development,” he concluded. The conference, entitled “The Role of Civil Society in Regional Development”, reviewed the specific results of the small grants programme and discussed future opportunities for cooperation, networking and advocacy.